After making some Red Curry Paste, I wanted to try it out. I didn’t feel like making my favorite panaeng-style curry, so I tried this recipe from a recent issue of Food Network Magazine. I really like this one – it’s easy and delicious. Plus, as an added bonus, the leftover sauce goes great with naan or pita chips! Earlier this week, I talked about making your own coconut milk from scratch. 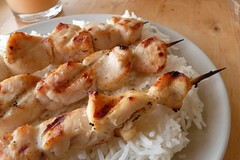 Here’s what we did with ours: chicken satay marinated in coconut milk and a spicy sauce over coconut rice. Definitely a keeper! The coconut rice uses some of the leftover coconut bits from squeezing out the milk, they add a subtle coconut flavor on their own but are best with a bit of coconut milk also replacing some of the cooking water. As for a side dish, we made some tangy pickled cucumber slices (recipe still needs some work, it was good but not right yet). Yes, you can buy coconut milk in cans. Most of the year, this is the cheapest way to acquire good coconut milk. Personally, I prefer the Thai Kitchen brand because it has coconut cream (solidified coconut milk), no additives and good taste where many of the other brands can be watery and bland. However, when coconuts are available, why not make your own? 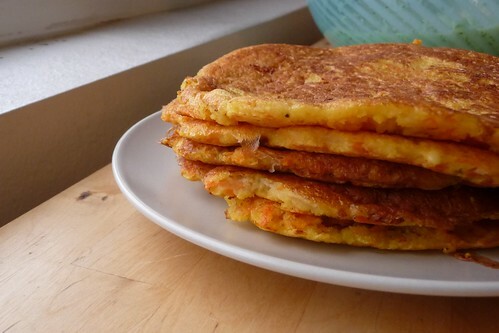 The two Thai coconuts we bought resulted in about 16 ounces of coconut milk plus tasty coconut fluffies to add to pancakes and smoothies for less than the price of 1 can. I wish I had pictures to show you but it was late and I was tired. These spring rolls are awfully good all out of proportion to their size. Also, they will fill you up fast, so plan accordingly – no more than one or two per person for an appetizer. And don’t skip the sauce – it really goes well with the rolls, though you could drizzle a bit on the filling instead.